The first of two excellent new female directed features to premiere on Netflix this month, Lauren Miller Rogen's Like Father begins with the tried-and-true romantic comedy premise of a bride being left at the altar before things move in a delightfully unexpected direction. Opting to leave strategic voice mail reminders instead of walking down the aisle on time, when her husband-to-be realizes that his fiancée has chosen her phone over him once again, Kristen Bell's workaholic bride Rachel finds herself without a groom. However when one man leaves, another arrives. 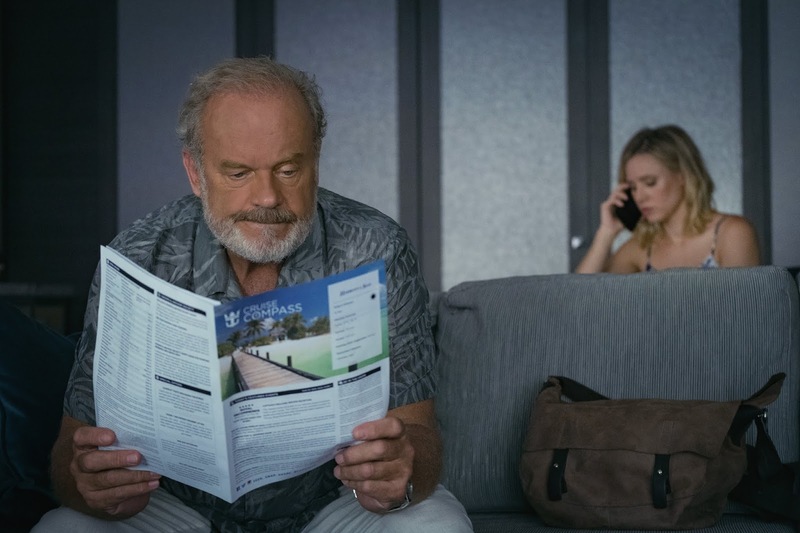 Surprised to be face-to-face with Harry (Kelsey Grammer), the estranged father she hasn't seen in decades, the two spend a spontaneous night of drunken commiserating after which, she's even more shocked to discover that they've wound up on her honeymoon. Trapped on a cruise ship together, while on one level the film works very well as an upbeat, feature length ad for Royal Caribbean – in stark contrast to the way that Adam Sandler has freely admitted he chooses exotic settings for his films as a way to vacation with family and friends – Like Father's setting serves a crucial role. Had the two reconnected and found themselves in say, Hawaii, they would've gotten on the next available flight back to reality as soon as they sobered up. But trapped in close quarters on a vessel where they don't know anyone else and are constantly congratulated by strangers who believe they're newlyweds, Rachel and Harry are forced to interact. Like two people stuck on a desert island, on a cruise ship in the middle of the ocean, Rachel can run but she can't hide. Addressing some of the practicalities of their instant vacation right away (like the fact that they'd left without luggage), as a storyteller, Miller Rogen is smart enough to know that they're not going to be able to dive right into the rift of their relationship without a serious push. And in Like Father, this comes in the form of an entertaining and wisely diverse ensemble of fellow travelers, including scene stealer Paul M. Downs as a new family therapist and one half of a gay couple as well as the filmmaker's husband Seth Rogen as a Canadian schoolteacher in a small but hilariously understated role. Calling Rachel out for her incessant cellphone use and pushing her and Harry into a number of the ship's activities – from appearing as contestants on a newlywed game show in one of the film's comedic highlights to hiking around Jamaican waterfalls – it's only a matter of time before emotions, grudges, and secrets erupt. Written over the course of six years (and seventeen drafts! ), following her the release of her first co-scripted effort For a Good Time Call..., after life dealt Miller Rogen a cruel hand following her mother's Alzheimer's diagnosis, she was inspired to turn that darkness into light, resulting in an ultimately sweet yet surprisingly moving, multilayered feature filmmaking debut. While the decision to incorporate some of the real world issues facing people today gives Father an unexpected sense of gravitas, Miller Rogen takes a cue from mid '80s John Hughes and (along with her charming stars) keeps things moving at a fast pace, knowing that it works against her upbeat, sunshine bright summer picture to dwell on things too long. Likewise working against some of the genre's stereotypes by taking Like Father out of the realm of romantic comedy and into the mainstream, despite some unavoidable predictability in plot, Miller Rogen does her best to take an unexpected approach. And one of the most impressive examples is in the way the writer/director makes sure that, although she needs to find a balance, Rachel isn't treated like a villain for (much like her father) loving her job. Immediately believable as father and daughter, in what – despite the fun ensemble vibe – is a terrific two-hander, the always likable Bell and Grammer serve and volley one-liners with ease, nicely adapting to changes in tone. 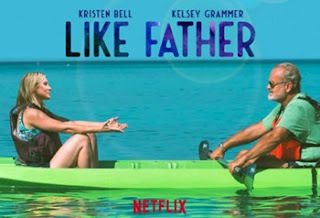 Delivering some of the staples of other Netflix movies including multi-generational appeal and a killer soundtrack, Like Father adds in cruise friendly karaoke tunes, knowing that when your film stars a Disney princess, you've absolutely got to get her to sing. While, yes, Royal Caribbean couldn't have paid for better advertising, in Like Father, Miller Rogen combines real world problems with traditional screwball and romcom building blocks to create a solidly entertaining summer comedy you're sure to stream more than once. And who knows, you might just call your relatives to come over and watch.